The world is oblivious to what is happening in Ukraine – Russia has been waging an undeclared war over the past 4 years since the Revolution of Dignity and the ousting of Russian backed President Victor Yanukovych. The Ukrainian army was under – resourced and unprepared for an invasion, therefore, many civilian Ukrainians formed volunteer battalions and took up arms to defend the sovereignty of their land. Many of these people who are no longer fighting on the front, continue the fight in a volunteer capacity, dedicating their time and skills in support of the soldiers. 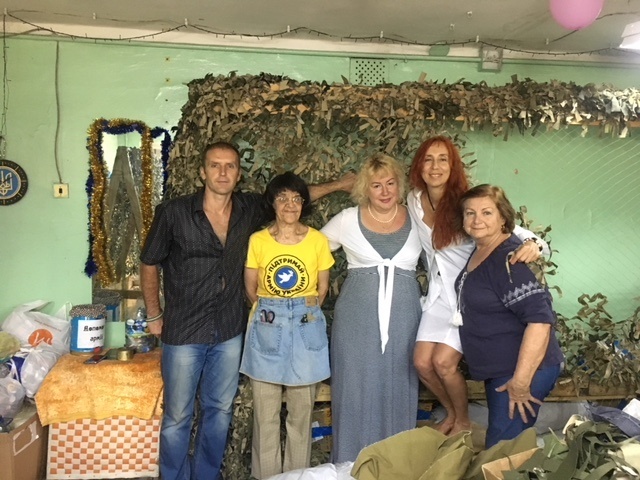 In July/August of this year, my sister-in-law Stephanie Tesoriero and I had the opportunity to travel to Ukraine to spend time with some of these amazing, inspiring and passionate people who are dedicated to helping with the war effort. We saw firsthand the kind of work that falls on these wonderful volunteer workers and feel truly blessed to have met them and had the privilege to be amongst them. This film features women from Zhaporizhia who have lost sons in the war between Ukraine and Russia. The heart wrenching stories of these women and their strength and determination to ensure that their children did not die in vain, was emotional and awe inspiring. Even though Russian is predominantly spoken in Zaporizhia, there is a huge core of patriots who love Ukraine and would lay their lives down for her. They fight for the right to be Ukrainian and uphold their history, culture and traditions. We met an amazing woman called Galina Goncharenko, who features in the documentary. She was one of the people who was instrumental in establishing the Soldatskiy Pryval, which is a soldiers stopover or resting place, in Zaporizhia. Witnessing hungry, tired war weary soldiers sleeping on the train station floors, a group of concerned Ukrainians headed by Galina, lobbied the local government and railway directors to support and help fund a refuge for soldiers travelling to and from the front. 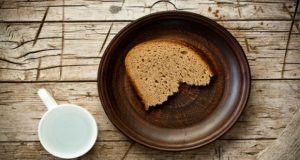 This refuge has been running for 2 years and is a comfort for many where they can enjoy a home cooked meal, a clean warm bed and a shower. The Pryval also has an in house psychological counselling service. The volunteers fundraise to sustain the Pryval and to send supplies, such as medicines, food, hygiene products and mechanical parts directly to the soldiers who are fighting in the trenches, which is a mere hour and a half drive away. The Soldatskiy Pryval also supports orphans and widows of deceased soldiers. 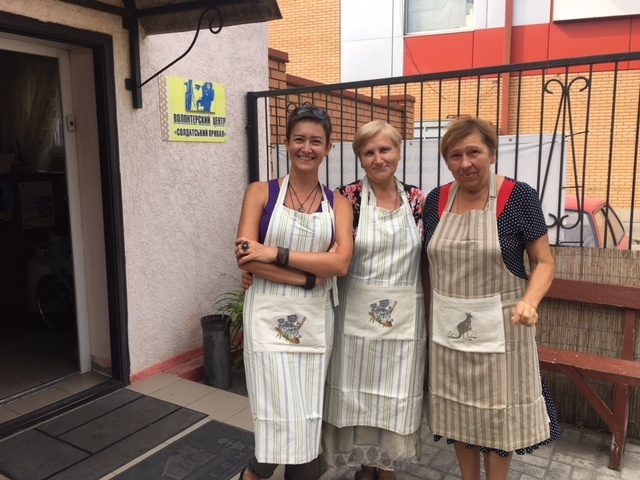 We discovered that there are many volunteer groups throughout Ukraine who work together or are interconnected. We were warmly greeted by The Ukrainian Women’s Association – Zaporyzhia vidil “Roxolana” headed by Nadia Moroz. 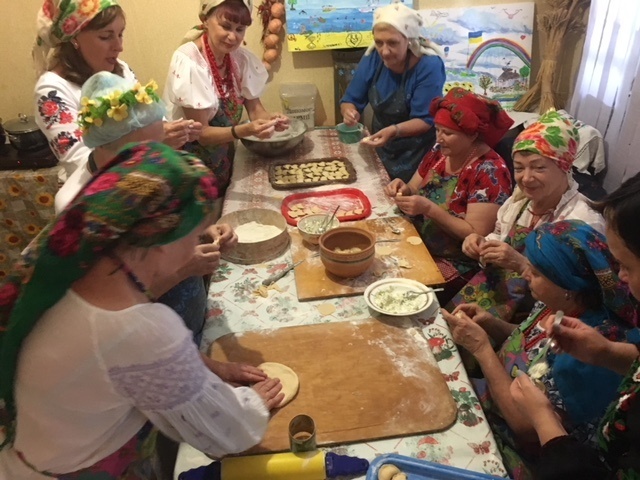 This group meets several times a week to make varenyky, then once or twice a month travel to the front to put on a banquet of Ukrainian food and entertain the soldiers with singing, music and poetry recitals. 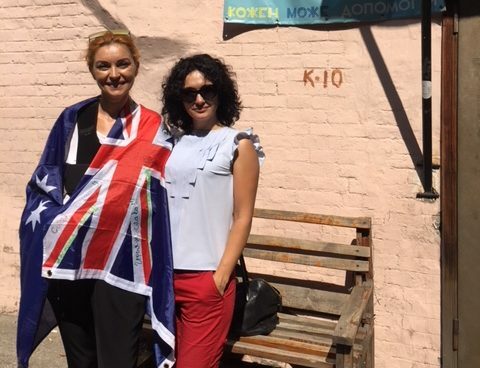 Through our visit Stephania forged a connection with them and the Ukrainian Women’s Association – Sydney vidil “Anna Yaroslavna”. They will maintain ties and work together for a united cause. A dedicated group of dentists who go by the name of “Tryzub”, who have converted old shipping containers into mobile dental clinics, travel to the front every 2 weeks to offer dental services to the soldiers. Similarly, a resourceful group of volunteers have converted shipping containers and old trucks into mobile bathrooms, which are a welcomed luxury amidst the tough conditions the soldiers are subjected too on the front. 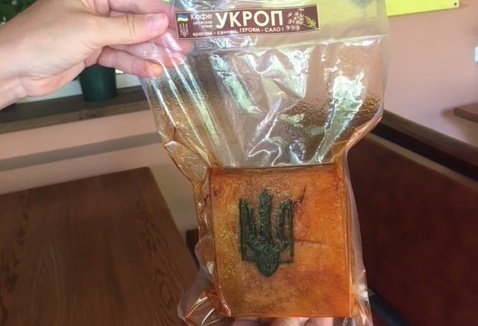 A restaurant in Zaporizia by the name of Ukrop serves traditional Ukrainian food – over the years the owner has donated tons of salo branded with a Tryzub design to the front. These are some of the examples of initiatives aimed at supporting and lifting morale of the brave men and women fighting for Ukraine’s freedom. Yet another group we met, dedicated their efforts towards making camouflage nets and paraffin candles to supply to the front. Each knot in the nets is done with love and a prayer, knowing that it is a gift of protection for their defenders. Having spent time amongst these tireless volunteers as they painstakingly went about their often monotonous chores, we were struck by their camaraderie, their positive outlook, their patriotism and love of their homeland. We were dismayed to learn that there is only one Ukrainian language newspaper in Zaporizhia and there is currently a battle with the local authorities to keep this newspaper alive. This highlights the struggle that the patriotic Ukrainians in Zaporizia face on a day to day basis to maintain their Ukrainian language and culture. From Zaporizhia we travelled to Kyiv where we were honored to participate in a ceremony for the National Flag Day. 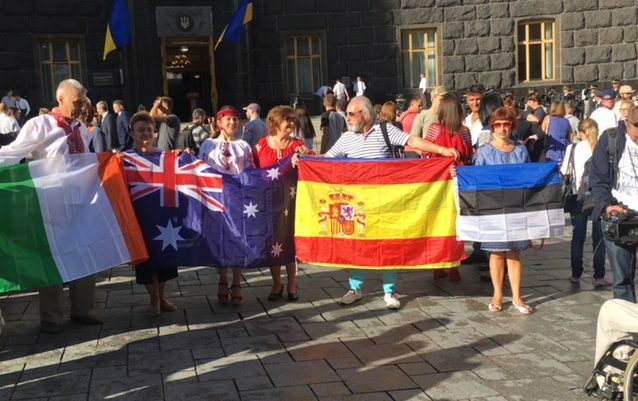 There were two large Ukrainian flags which had travelled around the world and had been signed by members of the Ukrainian diaspora with messages of support for Ukraine. Mykola Krytzek from Ireland was instrumental in instigating and coordinating this initiative which involved volunteers throughout the Ukrainian diaspora of Europe, America, and Australia. The flags were presented to ministers of parliament and the mayor of Kyiv Vitaly Klitchko. 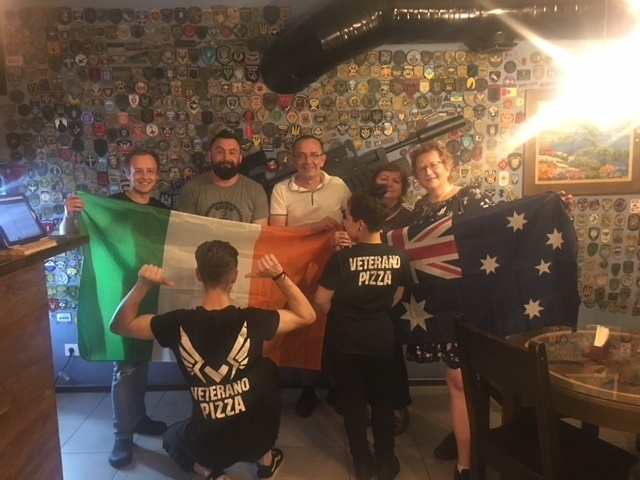 Ukrainians from many parts of the world attended this event and later informally gathered at a pizza restaurant called Veterano Pizza. This entrepreneurial franchise developed a unique and creative way of supporting war veterans. The project was founded by a veteran who had $150 in his pocket and borrowed the rest of the money to start the business. In more than 2 years of its operation, the number of veterans employed by the restaurants/coffee shops has grown to over 100. As well as providing the veterans with meaningful employment it is a meeting place for veterans and allows patrons to “pay forward” meals for veterans. They have also sent thousands of pizzas to various military hospitals. There is a military theme to the restaurants, where murals have been painted on walls by veterans and military paraphernalia and artifacts displayed throughout the restaurants. It was invigorating to witness many examples of innovative entrepreneurship throughout Ukraine and feel the positive vibes from people despite the current political and economic situation. Visiting the Kyiv Military hospital was a real eye opener for us, as facilities,conditions and recourses are limited, to say the least. Elena Lycenko and Tatiana Rudenko (see You Tube “Amazone”) gave us a good insight into the conditions and workings of the hospital and introduced us to some of the wounded soldiers. It is comforting to know that more recourses are now being allocated towards physical and mental health rehabilitation. This group of volunteers – “Volunteers Hundred” fund raise and supply healthy food, medicines, clothing, moral support, medical supplies and family support for those who need it. Through our conversations with the many volunteers, it is clear that financial support from the diaspora is always welcomed and productively utilized to support the war effort. The people we met were very surprised, grateful and humbled by the knowledge that there are Ukrainians in far flung countries like Australia thinking of them, hurting for them, praying for them and wanting to support them in any way they can. As the president of the Geelong Branch of the Association of Ukrainians in Victoria, I have proposed to my committee that we fundraise on an ongoing basis to support the work of the Soldatskiy Pryval in Zaporizhia and the Military Hospital in Kyiv. The committee has warmly welcomed this proposal and fundraising has already commenced. Stephanie and the Ukrainian Women’s Association – Sydney vidil “Anna Yaroslavna” will continue to fundraise and maintain contact with them. Having personally spent time with these wonderful volunteers, we have grown to know and trust them. We believe that their work is honest, and that our donations, no matter how small will go to the right people, the right places for the right purposes. Next: Bishop Peter: What can you personally do about World Peace?